Condensation of the gas above the process liquid slowly causes the low side of the transmitter piping to fill with liquid. The pipe is therefore purposely filled with a convenient reference fluid to eliminate this potential error. This is called a wet leg condition. In a wet leg application, the low pressure side of the level transmitter will always experience a higher pressure than the high pressure side. This type of installation requires that the height of the wet leg will always be equal to or greater than the maximum height of the liquid column (H) inside the tank. As can be seen, the differential pressure, ΔP, sensed by the transmitter is always a negative number (i.e. low pressure side is at a higher pressure than high pressure side) since in this application, Y is always greater than (H + X) and S.G2 is equal to or greater than S.G1. 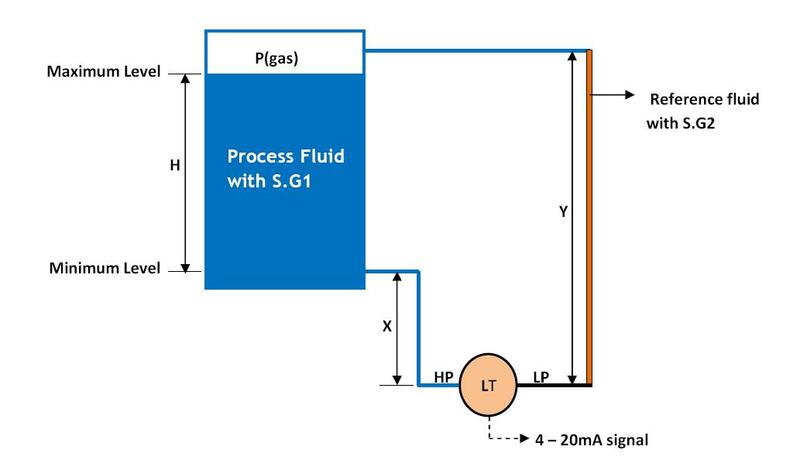 To properly calibrate this transmitter, a positive bias of (S.G2 * Y – S.G1 * X) is needed to elevate the transmitter output. 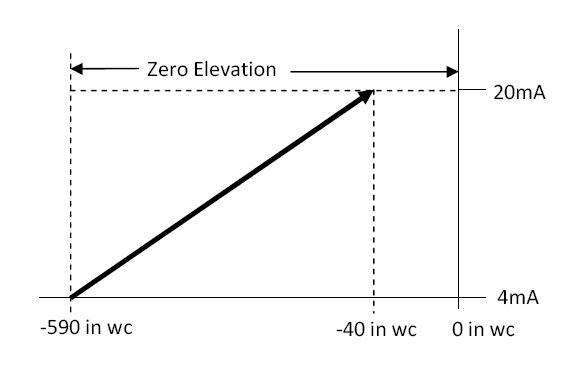 This calibration technique is called Zero Elevation. Want to go back to previous sections on Level Measurement?